Imagine the operating room of the future: Robots help perform the most-pinpoint operations; soothing green light improves visibility and protects surgeons’ eyes during long procedures; power booms suspended from the ceiling swivel within easy reach and lift cables off the floor and out of the way; endoscopic hardware and touch-screen displays provide immediate access to medical records, vital signs, x-rays and MRIs. Audiovisual capabilities are fully integrated to provide surgeons with necessary information for each operation – all in real time. Performing a particularly complex surgery? Use a touch screen hanging from the boom to confirm the approach with published research on the procedure or confer via streaming video with a colleague on the other side of the country. From the operating table, surgeons can control not only the medical equipment but also the lights and images shown on wall monitors. They have access to patient information, reference materials and the Internet. And throughout the procedure, the surgeon can capture images that will be electronically attached to the patient’s record – all using an easily navigable display. The future is now. “Traditionally, surgeons have been isolated in operating rooms. The phone would ring, and the nurse would hold it up to your ear. Now, just by touching a sterile touch screen, a surgeon can communicate with anyone in the UCLA environment or anyone outside UCLA,” says Dr. E. Carmack Holmes, a professor of thoracic surgery. “The surgeon is now connected locally and nationally. 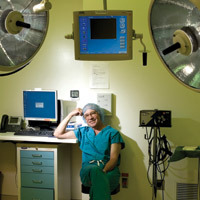 If he wants to be in contact with a surgeon in Chicago and talk about something, he can do it.”Whether it’s colleagues in different cities consulting on a case or a group of postgraduate students observing a procedure from a remote location, the ability to transmit what is happening in the OR in real time offers a remarkable tool. When Ronald Reagan UCLA Medical Center was first conceived in the wake of the 1994 Northridge earthquake, hospital administrators wanted the next surgical facility to be ahead of the curve. But as Dr. Holmes, who was chair of surgery at the time, observes, state-of-the-art for surgical technology is “a moving target.” Then he read a well-known statement by Alan Kay, an adjunct professor of computer science at UCLA: “The best way to predict the future is to invent it.” Dr. Holmes set out to do just that, beginning with the formation of The Center for Advanced Surgical and Interventional Technology (CASIT). The walls between specialty interventional procedures had broken down, but few hospitals had adjusted their floor plans accordingly. Often, procedure rooms were spread throughout the building – even on different floors – putting a burden on anesthesiologists, support staff and pre- and post-operative care. But why? This layout didn’t make sense to Dr. Holmes. The obvious course, he thought, would be to pair the space for related procedures, which he anticipated would reduce surgical errors, improve outcomes and decrease costs – not to mention the opportunities for more-aggressive procedures. So CASIT advocated placing the interventional rooms on the same floor with the operating rooms, a forward-thinking effort that, coupled with the latest technology, has attracted attention around the world. The new operating rooms also are built to withstand what has been a constant challenge in UCLA’s 1950s atomic-era hospital: the moving target of new technology, which has shifted numerous times just in the years that Ronald Reagan UCLA Medical Center was being built. Sleek and Streamlined, with gadgets and displays that could drive an electronics buff wild, the ORs are free of the clutter that is common to most operating suites, without the heavy, cord-laden carts and the abrasive lights. Instead, the technology was designed and arranged as integrated units to make the jobs of the surgeon and OR staff easier and improve patient care, says Dr. James B. Atkinson, chief of pediatric surgery and senior medical director of transition, leaving the operating rooms with a spacious, sterile feel. That ability to visualize the pathology is very useful for subsequent planning of treatment such as chemotherapy or radiation. “It’s much more useful than just looking at a written description. Even though the narrative may be of very good quality, it is not as informative as looking at the images,” Dr. Atkinson says. The new operating rooms also raise the potential for global education. Whether in a classroom on campus or somewhere around the world, students can observe a procedure through streaming video. They won’t simply see incisions obscured by surgeons’ shoulders, but will view transmitted images from cameras embedded in the lights directly over the operating field.